This week our team focused on analyzing the feedback from Mid Semester Review in order to narrow down the scope and focus of our project while me more forward into prototyping. As we began to reevaluate the scalability of our solution, we realized the information campaign should focus more on clarifying the user base of the food pantry and definitions of food insecurity in order to increase visibility on campus. 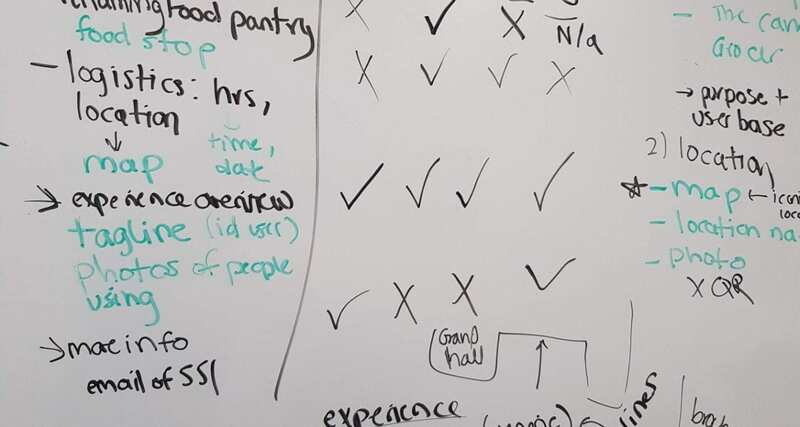 After we narrowed down to these few key gaps in knowledge, we began building low fidelity prototypes in order to test our assumptions about users’ various interactions with food insecurity and The Pantry. Out of the series of poster mockups that we made, we focused on low-fidelity prototypes in order to focus our tests purely on the informative, content basis rather than the design. Going into test, we will be presenting these poster mock ups to users in order better understand our user base’s understanding of food insecurity and relationship with on campus resources.